Left: Tin Kee founder Ding-Tin Wong in the 1950s; Right: D.T. Wong (center) with the Governor and Lady Grantham at the Tin Kee booth at HK Products Expo in the 1950s. 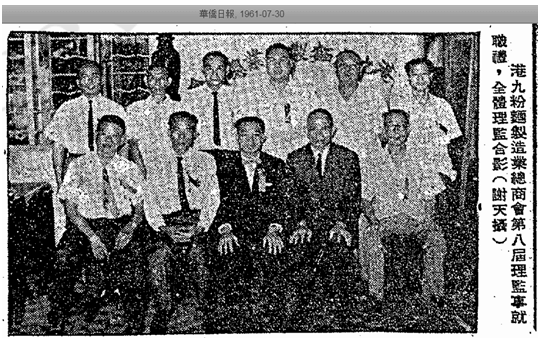 Sir Tsun-Nin Chau (first from left) and U Tat-chee (first from right) were also present. Aside from Pak Kut Noodle which was covered earlier on the website, another important pioneer in the history of machine-made noodles in Hong Kong is Tin Kee Noodle Products. Founded in 1942 by Ding-Tin Wong (黃丁田, 1916-2013, aka “D.T. 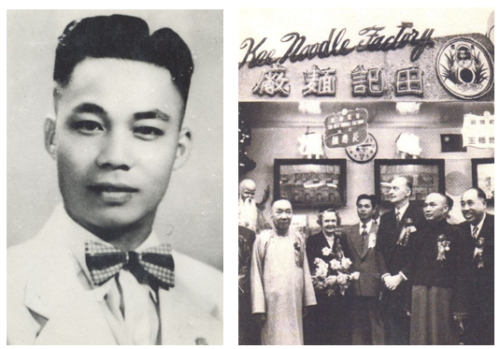 Wong”), Tin Kee remains a major player in the noodle business today after 75 years of operations and supplies noodles to major restaurant chains such as Café de Coral, Fairwood and Hsin Kuang and major supermarket chains. According to its website, it produces 5000 kilograms of Cantonese noodles and over 10000 kilograms of ho-fun per day and also makes specialty noodles such as spinach noodles, tomato noodles and carrot noodles. A native of Dongguan, D.T. 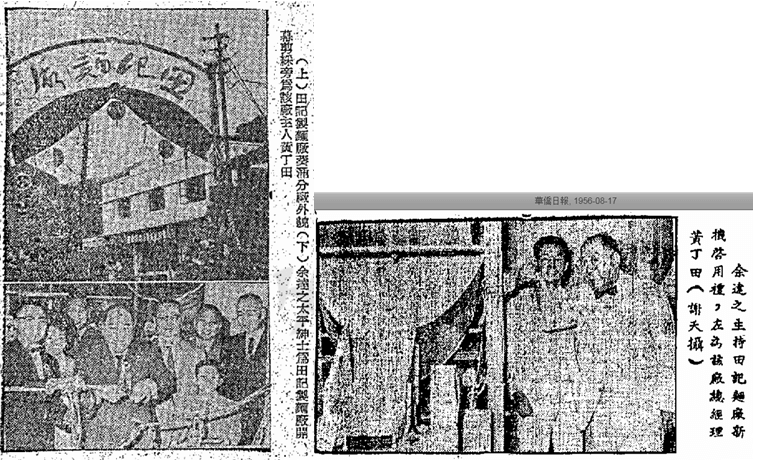 Wong came from a family of farmers and in fact his father Wong Fook-kwai (黃福貴) operated a farm in Kowloon by the name of Fook Kwai Yuen when he joined him in HK after 1949. Wong left his native Dongguan at the age of 12 in the 1920s for Canton where he started working as an apprentice at a noodle shop. He came to HK before the War and realizing the potential of mass produced noodles, he founded Tin Kee in 1942 under Japanese occupation. By 1947, he was the leader of the industry and led the formation of HK Kowloon Noodle Manufacturers Association (港九粉麫製造業總會) with himself as the chairman. When labor unrest took place at Tin Kee in 1955 after Wong fired a few staff members, this group stepped in to investigate and mediate. 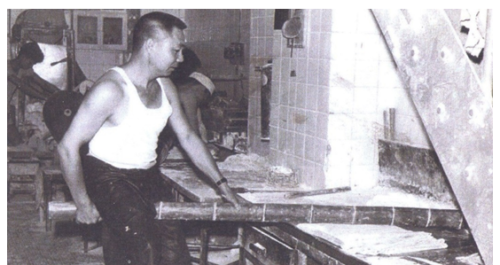 In the 1950s and the 1960s, David Sung of HK Flour Mill (to be covered later) as the largest supplier of domestic flour to the noodle industry was named honorary permanent chairman of the group. To differentiate from his competition, Wong spent a lot of time and money in promoting his brand and investing in new equipment and facilities to improve the production process and increase product variety in the 1950s. In 1952, Tin Kee produced a variety of noodles and was showing its products at the HK Products Expo where their booth was visited by Governor Grantham and Sir Shouson Chow. The firm also participated in trade fairs in Taiwan where it received famous calligraphy scrolls from the famous politician and calligrapher Yu Youren (grand uncle of former CUHK chancellor Professor Lawrence Lau). Wong picked eye catchy names for his noodles, such as longevity, Sze Sze (renowned ancient Chinese beauty) and Vita and even organized a naming competition in 1958 where someone came up with the name “Ho Song Fai” (“So great!”) which became one of its major products. 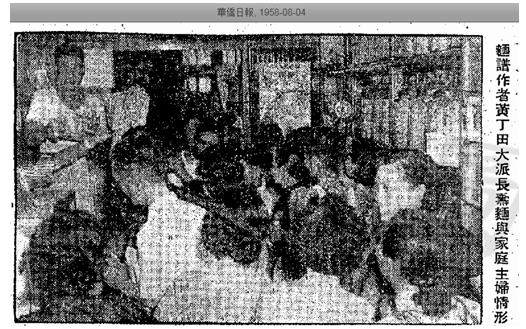 Wong also wrote a column on food and nutrition for Wah Kiu Yat Po, the most popular Chinese newspaper at the time and frequently spoke at cooking event to establish the firm’s reputation as noodle and food expert. He started Tin Kee Restaurant in Mongkok as a way to feature his noodles and other exotic dishes such as snakes. When he became dissatisfied with the quality of rice vermicelli (mai fan) in the market, he established a branch factory in Kwai Chung in 1962. (The main factory and store was located at 109 Tung Choi Street in Mongkok) By the 1960s, one of Tin Kee’s key brand was Crown brand noodle (皇冠牌) which according to reports in 1967 had many copycats in the market. Outside of work, Wong was also a founder of the Mongkok Kaifong Welfare Association and a longtime director of the Kowloon Chamber of Commerce. He also spent a lot of time on his two favorite hobbies – fishing and horticulture. He was the chairman of the HK Amateur Fishing Society and won a number of fishing competition organized by the group. 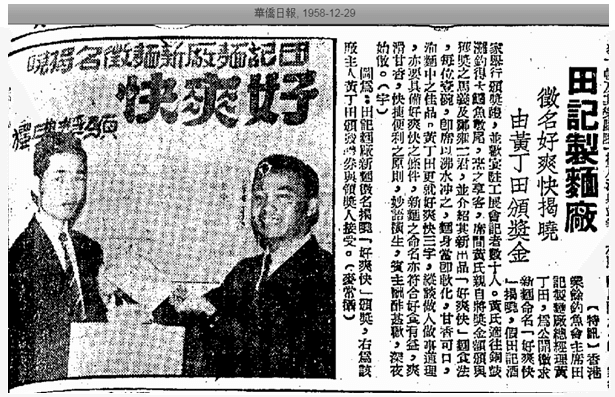 He co-founded the HK Artistic Pot Plants Association (盆栽藝研會, now HK Penjing & Artstone Society) in 1970 and was named vice chairman under chairman Ho Chi-wong (何智煌), the proprietor of Chun Hing Bakery in 1973. In the 1970s, Wong retired to the New Territories where he built an orchard in a several tens of thousands square feet plot of land at Pak Fook Village across from the Fanling Train Station. There he built three houses and spent most of his time gardening. In 1982 however, the government acquired his land for development and before the orchard’s closure, he hosted an exhibition of the hundreds of orchid plants and rocks in his collection. D.T. Wong moved to Hawaii in 1984 where he launched Crown Noodle and Tin Kee Noodle Factory USA, supplying Chinese and Western noodles to local restaurants and supermarkets. 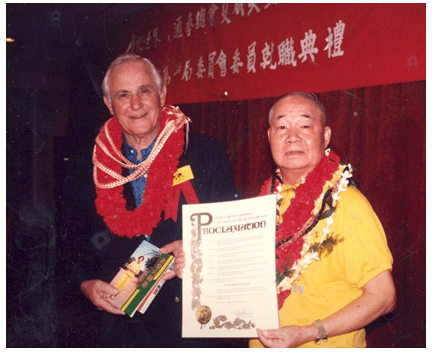 He continued to be active in the community and started the Hawaii chapter of Luk Tung Kuen, a 36 movements exercise created by Ho King who became a worldwide phenomenon in Chinese communities in the 1980s. For his community involvement, the mayor of Honolulu honored him with “D.T. Wong Day” one year. Wong died in Hawaii in 2013 at the age of 96 and was survived by 3 sons (the eldest Tin-Kow worked as a teacher, second son Patrick is president of Tin Kee Noodle US and third son Tony runs Tin Kee HK) and 5 daughters. This article was first posted on 23rd March 2018.